The costal cartilage is a set of hyaline cartilage bands that attach the medial end of the seven true ribs to the lateral border of the sternum (breastbone). 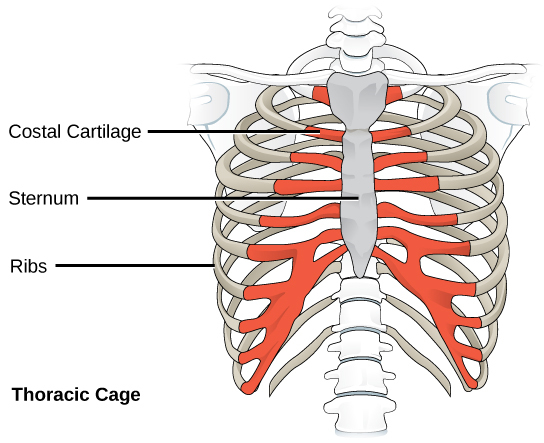 Costal (cost- = rib) cartilage also connects the three superior false ribs to the sternum, but these false ribs are attached indirectly by way of the seventh true rib’s cartilage band. The costal cartilage forms a semi-movable joint between the true ribs and the sternum. This joint permits flexibility in the rib cage while keeping the ribs firmly connected to the sternum. The flexibility of the costal cartilage allows the ribcage to expand along with the lungs during deep inhalation. It also allows the thoracic region to bend laterally, anteriorly, and posteriorly. Finally, the costal cartilage may act as a shock absorber to prevent blows to the anterior portion of the chest from resulting in rib fractures. After a direct impact, the costal cartilage can become separated from the end of the rib that it is normally attached to. This painful condition is known as a rib separation. Given enough time and rest, a rib and cartilage will fuse back together again. The costal cartilage may also become inflamed in a condition known as costochondritis. Costochondritis causes chest pain, which is not life threatening but may be confused with a symptom of a heart attack. As with a rib separation, the body will repair costochondritis and symptoms will go away on their own.